There are lots of great reasons to visit Greenwich Village. And great pizza is certainly one of them! And in this post, we highlight 5 of our neighborhood favorites for a fresh and delicious slice (or two!). Most locals will tell you that NYC has the best pizza (our clean and tasty tap water is the secret “ingredient”) and many visitors would agree. And Greenwich Village makes it easy to sample your way from one great pizzeria to another, since these five great Village spots are a pepperoni’s throw away from each other. Don’t have time to read this on your screen right now? Click here to get this as a free and printer-friendly PDF file in your inbox and take it with you to NYC (with a larger map)! And if you need help navigating the subway to get to Greenwich Village, check out our helpful beginner’s guide to using the NYC subway. 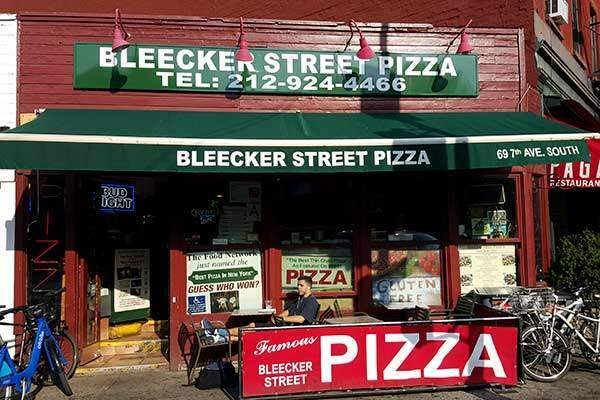 Voted “Best Pizza in NY” by the Food Network several times, Bleecker Street Pizza is cramped, casual, and the walls are full of the requisite celebrity photos (think Mike Tyson and Steven Tyler without makeup). And they make some of the best pizza around. Try their signature Nonna Maria slice, with home-made marinara sauce, fresh mozzarella cheese and basil. The great news is that in 2018, Bleecker Street Pizza expanded next door and now offers a nice sit-down dining experience as well, if you’re not in a rush. Same great pizza, but more elbow room! 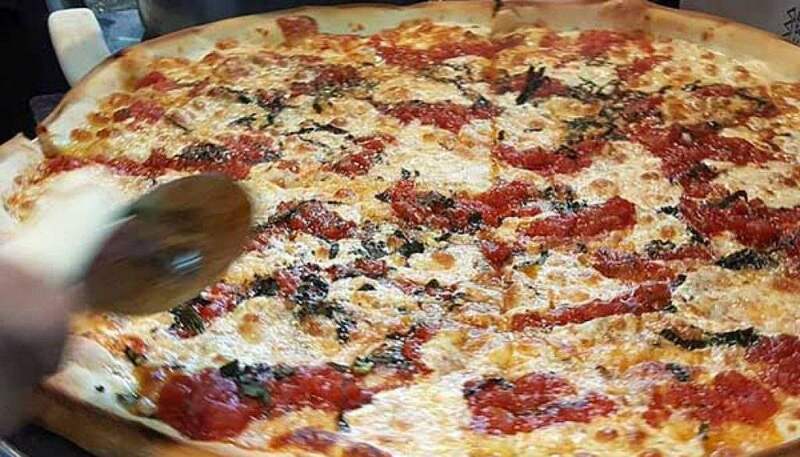 In fact, if your time is limited and you can only pick one pizza spot on this list, we can wholeheartedly recommend the Nonna Maria slice at Bleecker Street Pizza. You might just get a second slice! You will be salivating for more. Luckily, they are open until 5am Friday through Sunday, so you can always come back for a late-night snack between bar hops. 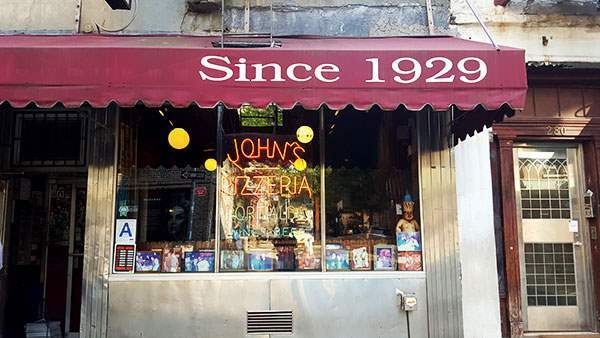 John’s Pizza has been serving customers on Bleecker St since 1929! First rule of John’s (of Bleecker Street) Pizza — absolutely no slices! So come hungry and bring a friend or significant other to share a classic pie with. You won’t regret it. They’ve been cranking out pies from their brick oven at this location since 1929, so it’s safe to say they have it down pat. Leave your mark by carving your initials in the wooden booths (if you can find space, that is). Expect a wait to get in, especially on weekends (they don’t take reservations). Diagonally across from John’s is a different kind of pizza restaurant that has earned some serious street cred and rave reviews during its decade-long existence (opened in 2009). The name Kesté means “this is it” in the Neapolitan dialect, which is fitting since this place is all about Neapolitan pizza, run by an Italian-born chef who studied pizza-making in Naples. So while the first 2 recommendations feature NY-style pizza (a thin-crust slice which you can fold, hold and eat), Kesté requires table seating and the use of a fork and knife (gasp!). The ingredients are fresh and the choice of toppings varied. You can get a nice glass of wine to go with your pizza and warm up with home-made burrata, served with prosciutto di parma. They have a custom-built oven, in which your pie cooks in less than a minute. This “no-frills” cash-only Village staple (circa 1975) sells more plain and pepperoni slices on a daily basis than we can fathom. Bring some cash, get a slice or two to go (there isn’t much seating) and grab a spot on one of the benches in Father Demo Square across the street. Do some people watching while munching on the thin crust, fresh cheese and pepperoni. Just leave some crust for the resident pigeons. Expect a line out the door during the lunch rush at most times on weekends. By the way, you might recognize Joe’s from Spider-Man 2 (2004). If you need a refresher, check out this pizza delivery scene. The last recommendation on our list isn’t really a pizza joint. It’s a cozy Italian restaurant, with an inviting glass-roofed garden in the rear and a jazz bar downstairs. La Lanterna’s menu is pretty extensive, and it includes a large section of thin-crust, made-to-order, 10-inch pizza. Here, you can enjoy an intimate dinner, while satiating your pizza craving. And while there are no celebrity photos, they offer nice decor, Sinatra tunes, and even put a candle on your table. Be sure to leave room for their mouth-watering tiramisu and wash it down with a tasty caffe latte. Afterwards, head to the basement for live jazz and drinks at Bar Next Door. You can’t go wrong with any of these places, so perhaps get to Bleecker Street really hungry and do a self-guided pizza jaunt. 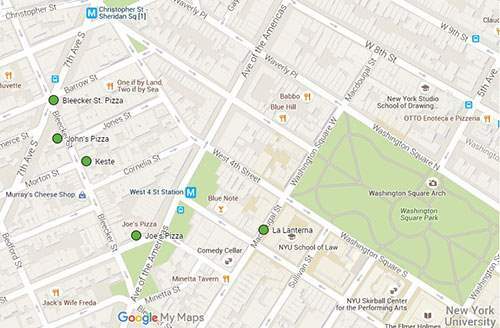 Working west to east, you’d hit Bleecker, John’s, Kesté, Joe’s, and La Lanterna. Enjoy! Click here to get this pizza guide as a free and printer-friendly PDF file in your inbox and take it with you to NYC (with a larger map)!